Virginia dayflower (Commelina virginica) of the Dayflower (Commelinaceae) Family is a perennial herbaceous monocot (one seed-leaf) that favors shaded areas with wet soils. It occurs in the U.S. from Texas to Nebraska to New York and south to the borders. 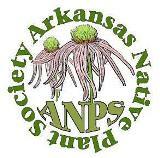 In Arkansas, this plant is found statewide except for some highland areas in the north-central portion of the Ozark Plateau. Virginia dayflower grows in shallow standing water or where frequent inundation occurs such as along swamps, rivers, streams and ditches. It is also called woods dayflower. The genus name honors two Dutch botanists surnamed “Commelin”. Virginia dayflower has white rhizomes with a cross-section size similar to that of the stems. 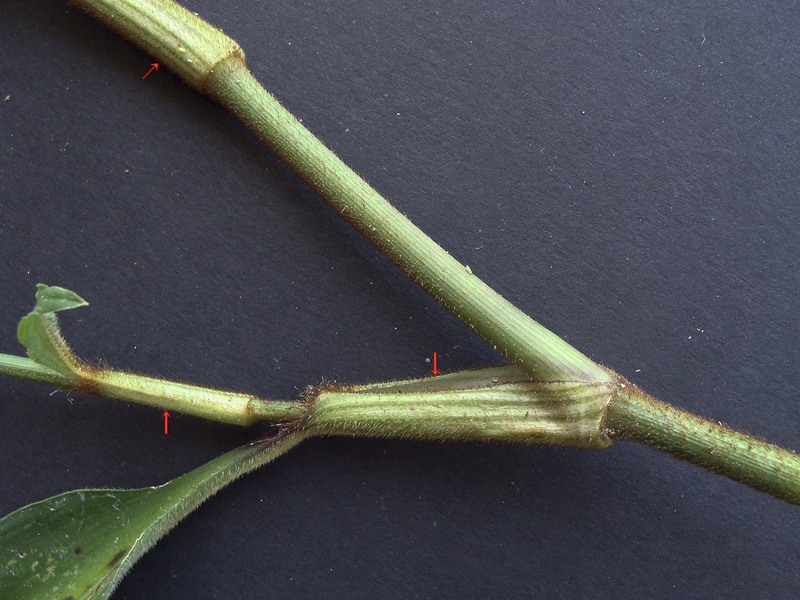 New growth of rhizomes is node-to-node from a sheath. Fibrous roots grow from nodes of the rhizomes. Stems, remaining mostly erect, may reach 3 feet. They can be glabrous (no hairs), pubescent (short soft hairs), to hispid (short bristly hairs), and show various shades of green to reddish with minute striping. Photo 1: Erect plants of Virginia dayflower grow from rhizomes in wet areas. Stems are reddish in this mid-July photo. 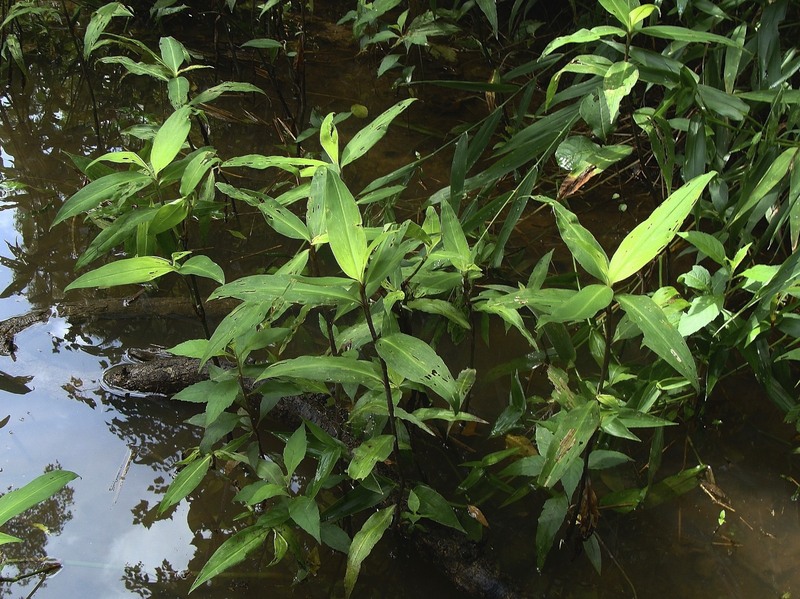 Leaves, up to 5 inches long and 1½ inches wide, are elliptic-lanceolate with sheaths up to an inch long. Stems at base of leaf sheaths are slightly enlarged. Leaf sheaths wrap tightly all around the stem, but are pushed away by secondary, lateral stems. Sheaths are noticeably striped due to various combinations of green, white and red. Leaves, with a tapering long tip (acuminate), have parallel venation. Leaves feel slightly rough above and smooth below. Undersides of leaves have light colored short hairs, especially on main veins. Sheaths have short to long prominent reddish hairs with longest hairs occurring at upper end of sheaths, especially along edges. Leaves continue up-stem into the inflorescence, becoming much shorter. Photo 2: Hispid nature of plant shown is evident. Leaf sheaths (arrows) have stripes and long hairs at junction with leaf blade. Short white hairs can be seen on underside of leaves. Inflorescences in mid to late summer, at the tips of main and secondary stems, consist of tight clusters of two to ten flattened spathes on short stalks. In larger clusters, a large spathe may enclose several smaller spathes with flowers. Spathes are boat-like with a pointed bow, rounded stern, and pronounced keel. The keel is sealed and rounded below, while the topside is open. A spathe envelops a single peduncle with up to five lateral alternate flower buds in a cyme (in scorpiod fashion). Spathes are glabrous and filled with clear slime similar to egg whites. Photo 3: Three peduncles shown with spathes removed. White arrows indicate bud clusters and red arrow indicates a developing ovary. Pink arrows indicate sepals. Yellow arrow indicates a faded flower. Blue arrow indicates peduncle of a hidden, less developed spathe. Flowers, about 1 inch wide, open at day break and wilt about mid-day. Typically, one flower of a spathe blooms per day. A flower has two upper petals and a slightly smaller lower petal. Light blue petals are orbicular and slightly ruffled with a narrow stalk-like base (claw). Flowers have three fertile stamens (two with greyish anthers and one with a yellow anther), three infertile stamens (staminodes) with showy yellow lobed anthers, and a pistil. Filaments and style are white to translucent. Two membranous sepals occur behind the lower petal. Photo 4: Stamens, staminodes and pistil (of left flower) can be seen. Sepals below the lower (smaller) petal of upper flower can be seen. Photo 5: A bee-fly feeding on pollen of a fertile anther (blocked by fly). Note lobes of staminodes. Photo 6: Leaf beetles poised for flight. Note venation of spathes. 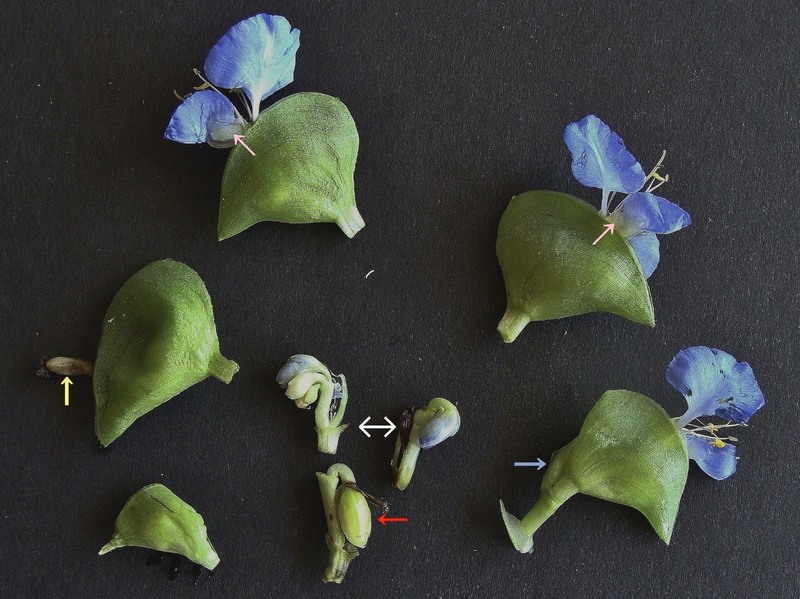 Fertilized flowers form three-celled capsules within the spathes with one seed per cell. Spathes become brown and persist on a green stalk into the fall. Four other species in the Commelina genus occur in Arkansas: Erect dayflower (Commelina erecta) is a native perennial with two blue and one white petal, and has curled fertile stamens and pistil. 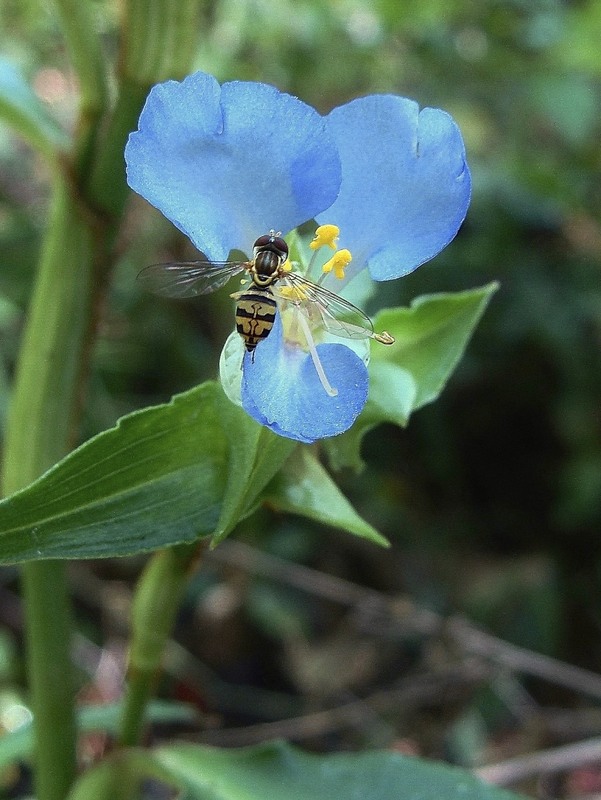 Spreading or climbing dayflower (Commelina diffusa) is a non-native perennial with three blue petals, blue anthers and white hairs. 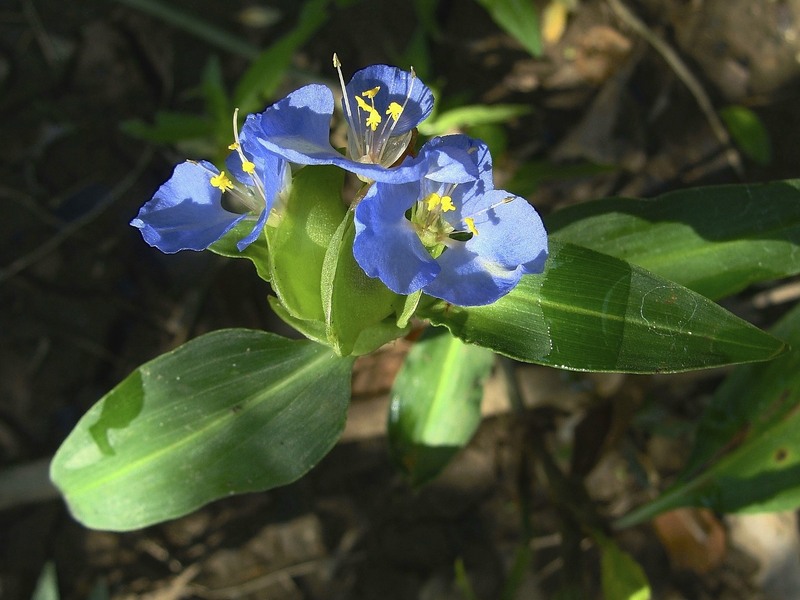 Carolina dayflower (Commelina caroliniana) is a non-native annual with three blue petals with yellow stamens and staminodes. Asiatic dayflower (Commelina communis), the type species*, is a decumbent (reclined) non-native annual with two showy blue petals and a much smaller, obscure white petal. ** All species occur mostly statewide except Carolina dayflower which is found in the southeastern portion. * The species to which a certain genus name is formally attached, thus presenting the defining features of the genus. ** As mentioned above, the commemorative genus name Commelina honors two Dutch brothers who made significant contributions to botany. They are represented by the two large, blue petals in each flower. However, there was a third Commelin brother, also a botanist, whose contributions were far less notable. Linnaeus recognized the third brother by reference to the small and obscure white petal in each flower of the type species, C. communis. 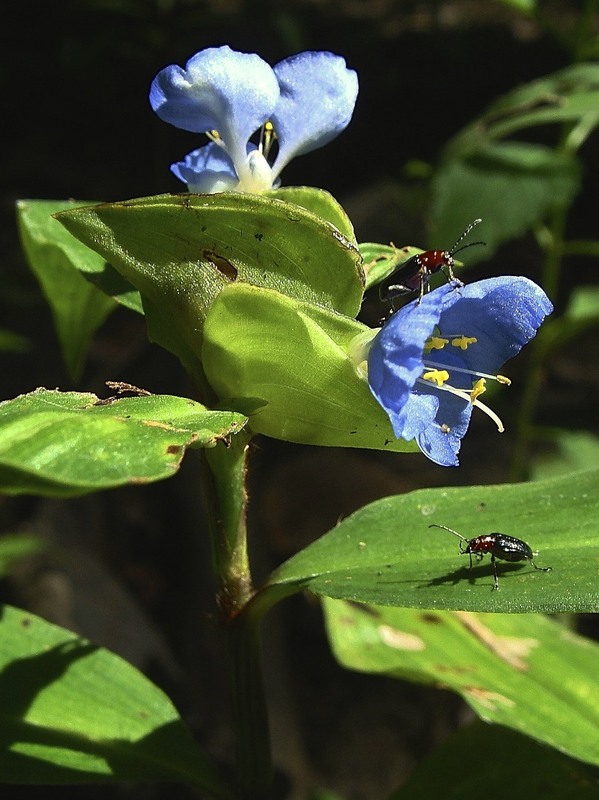 This entry was posted in Know Your Natives, Native Plants, Wildflowers and tagged Commelina, Commelina virginica, Commelinaceae, Know Your Natives, Virginia Dayflower. Bookmark the permalink.